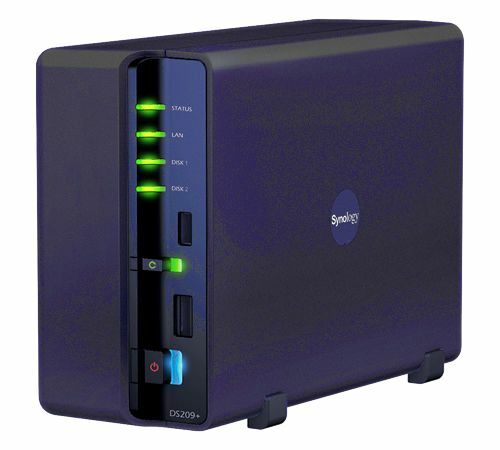 Early in 2008 our friends at Synology sent TechwareLabs their DS207+ to review which till this review has been the handiest NAS system this reviewer has reviewed so far. Since the posting of the DS207+, Synology has release several updates for the DS207+ which has added new features such as NFS and a web interface that is packed with so many features it would appear overwhelming , but with every feature an explanation about that feature is provided. Those of you who are working with VMware ESX Enterprise, the NFS feature have opened up a whole new avenue for lab setups which allow for Vmotion. The performance of DS207+with two SATA drives in a mirror (or Stripe if one wanted to risk the loss of the data on the volume due to a drive failure in order to gain performance) only allowed two or three virtual machines (VMs) to run at a very low performance. Virtual machine administrators are still able to test out designs and features. Late January, 2009 Synology has sent TechwareLabs their new DS209+ which has simply done nothing but impress. The DS209+ comes with much of the same features we had with the DS207+ but it also includes increased disk I/O speeds and the ability to handle up to 2 terabyte SATA II drives. There are a countless possibilities any one person could use a NAS. To list a few, a NAS could be used in the home to store family photos, music and even movies which can be shared by the entire household and personal folders can be established for each person in the family and permissions set to allow only that individual access. Also if there is someone in that family who is comfortable enough, it is also possible to setup the DS209+ to be accessed by the internet with the help of a DDNS. The DS209+’s power management will spin down the hard drives during inactivity to save on energy and heat generation. Along with the power management features is the option to not only turn off the DS209+ at a specific time, but also turn it on. For businesses which are looking to get a reliable server this can handle a growing business’s needs, DS209+ has a lot to offer. Along with the web hosting feature explained above which can host the company’s web site, the web pages can be coded with PHP to work with the built in MySQL version 5.0.51 at the time of this review. Let us take a look at the laundry list of Specifications the DS209+ has to offer. and so much more..Click Here.